No kidding, techno institution Tresor goes post-Harthouse when two French producers, DJ Deep and Roman Poncet, are pacing the night with swirling trance-induced cuts in “Extraction”. It is a different and stimulating release in current techno landscape, although during first listen I felt a little puzzled how to take it. Having started with spectacular air show “Extracapsular Extraction”, the highlight arrives with intrepid arpeggios and steaming bass stabs in “Data Retrieval”, a reanimation session for the goa generation. The B-side is filled with seven minutes of intense pulses in “Extraction Force”, for broadcasting in Elon Musk’s Hyperloop. DJ Deep has been active for over 20 years and mainly associated with house scene, being also the founder of the Deeply Rooted label, while Roman Poncet is a relative newcomer who debuted in 2013. Gathered under the banner of Adventice, they have an impressive starts that does not let you fall asleep. 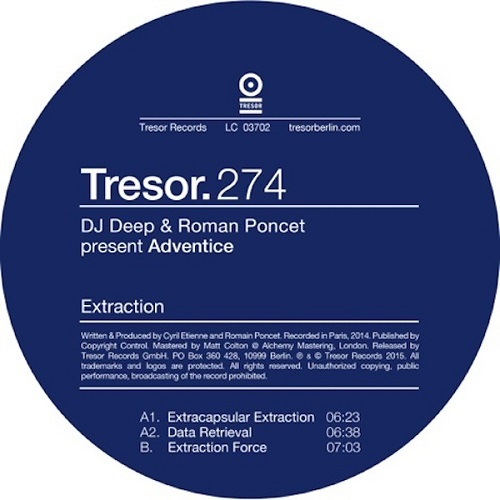 Released simultaneously as Tresor.275, Hood-inspired “Hydraulic Pressure” rolls nicely too, reaffirming a credible launch of the Adventice project by the Frenchmen. P.S. : I remember a techno night in mid-1990s, when a quite reasonable bloke spoke enthusiastically about labels he had just discovered, mentioning the ones like Dragonfly or T.I.P. He really did not make friends with this type of passion because (goa) trance was the no-go in the ‘serious’ techno scene. However, when the time has passed, the view might have been changing.